Mosquito Control in the Winter | What About Mosquitoes in the Winter? Most people didn’t think much about mosquito control in the winter. In fact, there was a time when mosquitoes were thought of as nothing more than a nuisance. Their pesky bites would cause swelling and itching, and when the uncomfortable symptoms went away, life went on as usual. This was especially true in the United States, where severe diseases carried by mosquitoes, such as malaria, were rare. However, recent years have seen a spike in concern over mosquito borne illnesses. Every spring and summer there is renewed interest in the West Nile virus carried by mosquitoes, especially in the South and Southeast, including here in Georgia. Perhaps the greatest mosquito related scare has come from the recent outbreak of Zika. The Zika virus has shed light on the new reality of mosquito borne illnesses in a globally connected world. But What About Mosquitoes in the Winter? Most people think that the winter months mean there’s nothing to worry about when it comes to mosquitoes. But the winter is not entirely mosquito free. As the weather gets colder and people spend less time outdoors, we tend think less about our outdoor comfort. Colder weather also means that mosquitoes are less active, so it seems as if the problem has gone away. But good mosquito control means you can’t stop thinking about mosquitoes just because the weather gets colder. The truth is that mosquitoes don’t just disappear in the winter. Instead, most mosquitos will spend the winter hibernating or in a state of diapause. How mosquitoes survive the winter depends on the species. Some species survive a cold winter as adults in a state of hibernation. They seek out hollow logs or hide in burrows that other animals have left behind. They may also spend the winter in human created shelters, such as inside the walls of building and other warm spaces. As the weather begins to warm in late winter, the awaken from their hibernation. Many species of mosquitoes that live in regions with cold or freezing winters spend their winters in a state called diapause. This means that they begin their life cycle as eggs, larvae, or pupae during the warm summer of fall months, but as the temperature drops they halt their development and can remain for months in their current state. When warmer weather returns, as early as late winter, the mosquitoes whose development has been halted resume their regular life cycle and can become biting adults in a matter of days. This is long before most of us have even starting to think about spring and summer mosquito control. Abandoning mosquito control in the winter months leaves you unprepared for the reemergence of mosquitos in late winter and early spring. Here in Georgia we tend to have mild winters. The weather starts to warm up as early as late February or March, at least for a few days here and there. This means that mosquitos will start to appear back on the scene well before the traditional start of spring. The best thing you can do to prepare for the return of mosquitoes is to make sure that there is nowhere for dormant eggs or larvae to spend the winter months. Standing water is a larval mosquitoes best friend, so it should be the first thing you go after to prevent adult mosquitoes from taking over when the weather warms up. Mosquito eggs and larvae can survive in the tiniest bit of standing water, no more than the amount of water it takes to fill a soda bottle cap. In the winter, with cold weather and rainy days, it can be a challenge to find all the little pools of water and dump each one. Falling leaves make this an especially difficult task. Water gathered in a fallen leaf is a prime breeding ground for mosquitoes. It is important to clear fallen leaves if you want to rob the mosquitoes of their breeding grounds. Another place to look for standing water is any outdoor furniture or patio furniture. Little divots in the furniture or other hard to reach spots may be harboring small pools of water, enough to house a whole brood of mosquito eggs. Of course, larger pools of water and puddles that stick around after the rain has stopped are key areas to deal with to avoid mosquitoes. Many homes have standing pools of rainwater due to poor drainage is some parts of the property. It may seem like a lot of work, but addressing these issues is worth it in the long run. Avoiding standing water with appropriate drainage is good for your comfort and your health. Mosquitoes don’t disappear in the winter. They are still around, either as adults sheltering in hidden structures or as developing mosquitoes in a state of diapause. Either way, they are sure to come right back to life when the weather gets warmer. But there is only so much you can do about it. You can minimize the number of mosquitoes that will survive the winter by reducing the number of places for them to hide. Clearing standing water robs developing mosquitoes of their homes and makes it harder for the eggs to hatch in the spring. But getting rid of every tiny pool of water is nearly impossible. So what else can you do? When you think about mosquito control over the winter, a lot of the work is a matter of planning for the imminent return of warm weather, and with it the return of active, biting adult mosquitoes. Use your winter to set up your mosquito control system before the mosquitoes come out in force. 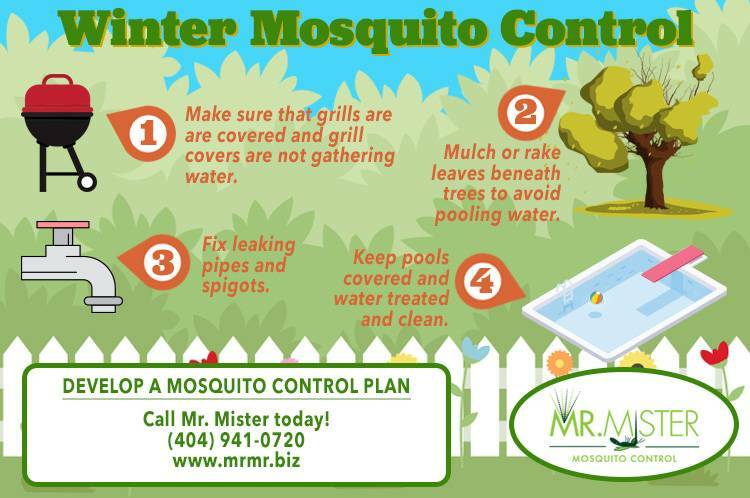 Mr. Mister offers a variety of ways to put a plan in place that will keep you protected from the very first moment mosquitoes become active, so you can stay one step ahead of the problem. The best way to get to the mosquitoes before they can get to you is to call Mr. Mister before mosquito season begins. You can get a quote any time. There’s no obligation and it’s totally free. The ClearZone Misting service is simple. A team member from Mr. Mister will come to your home and spray a special solution around your home. They will treat the perimeter of your home as well as bushes, grass, or any other areas that may harbor mosquitoes or their eggs. They will also pay extra attention to possible problem areas, such as areas of standing water, drains, downspouts, or other perpetually moist areas. The solution used in the ClearZone Misting treatment is 100% biodegradable. It leaves no active residue and is safe for adults, children, and pets. The solution sticks to the underside of the foliage around your home and lasts for at least 21 days. It not only kills adult mosquitoes and their larvae, it inhibits mosquito reproduction, reducing the next generation of pests. After 21 days, your Mr. Mister team member will return for a new treatment. The treatments will continue every three weeks throughout mosquito season. And if you find any mosquitos between treatments, we’ll come back out and do an interim treatment to keep your home totally bug free. For the absolutely strongest mosquito control solution, Mr. Mister offers automatic mosquito misting systems. Mr. Mister team members will install a system of nozzles similar to a sprinkler system. The system is neatly hidden away around the perimeter of your home, creating a bug free zone around your home. The nozzle swill spray a fine mist at dawn, dusk, and evening hours. This ensures that you get mosquitoes when they are most active and avoid beneficial insects, such a pollinating bees and butterflies, which are less active at those time. The automatic mosquito misting system provides protection from other pests, too. The system can protect against gants, flies, ticks, wasps, spiders, and fleas in addition to mosquitoes. It is your very best form of protection from all pests.